President Rich Catanzaro led Dave Turner, Ed Welch, and Chris Rich on a tarpon seeking fishout to Isla Holbox, a slender island off the tip of the Yucatan Peninsula. We arrived Thursday, July 7, after a flight to Cancun, a two-hour taxi ride to the village of Chiquila, and a 30-minute boat ride to Isla Holbox. Although we can all testify that the mosquitoes are doing better than the tarpon, we had a great trip. Staying at Faro Viejo hotel, we fished Friday through Wednesday, searching for tarpon large and small and catching tarpon, snook, perch, barracuda, and pargo (snapper with canine teeth). 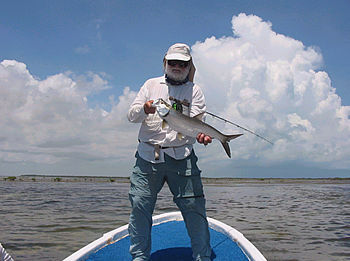 Ed got a Holbox grandslam with tarpon, snook, and pargo on the same day. Out at 6:30 each morning we started most days searching the deep for the big ones. Despite one sighting on the first day, the giant tarpon eluded us, so we spent a good deal of time in the lagoons and mangroves searching out baby tarpon. 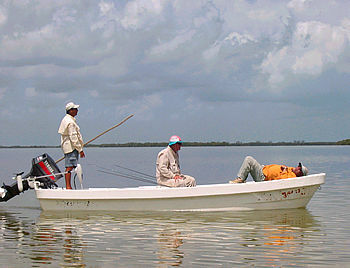 The mangroves had more mosquitoes than fish, so the guides weren't anxious to stay there long, but we did provide them (the guides) with the perch por comeda that too often nudged the tarpon away from our flies. The elusive tarpon placed a premium on distance casting, and Dave took the prize for "getting it out there." By the end of the week we had all landed tarpon, but not many. No records were kept, so we can all lie about who got the biggest and how much each weighed. Dave, Ed and Rich have legitimate bragging rights, as attested by the accompanying pictures. Chris stuck a hook in his ear, so maybe he can claim the grand prize for the largest sucker. The heat often reached 95� with matching humidity, though on our last fishing day we learned how intense a twenty-minute tropical rainstorm can be. Cooled us down quickly. Most days we were back at the dock by about 2:30, ready to retire for a siesta. 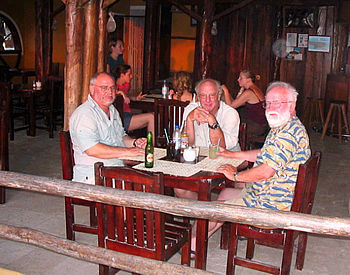 We regrouped about 5 p.m. to tell lies and review the day over libations and eventually dinner. The hotel was more than adequate, with the rooms cooled by fans and modest air conditioning; the food was fine but not distinguished; and the people friendly and helpful. We flew back Thursday night, just ahead of Hurricane Emily, which has Isla Holbox in her sights as I write this. It's fair to say we're all glad we went, and glad we're home safely. We had a great time, didn't catch a lot of fish, but are ready to try for tarpon again.